Holland Bar Stool Company has been the in the furniture manufacturing business for over 2 decades. As time passed, our line has expanded from bar stools into game products and game. The Enduro Top is moisture-proof and water-resistant. Even if the Enduro Top gets punctured, it will not absorb moisture because of the patented, premium composite. The Enduro Top is UV-resistant; in fact, the Enduro Top will not fade more than 5% over a 5 year period with exposure to direct sunlight. The Enduro Top is scratch-resistant. The Enduro Top is dent resistant. The Enduro Top utilizes a premium composite of materials. The material is precisely molded under high pressure and temperature. Covered in a durable laminate, it allows the Enduro Top to withstand abrasion and impact. The Enduro Top is heat and burn resistant. The Enduro Top shows no adverse affects from hot elements, like food, cooking ware, or even burning cigarettes. And the best part of all is it's ease of clean-up. Just add a bit of water, and wipe clean. Now that's superior innovation! The Enduro Top is stain-resistant. We allowed this red wine to sit for 24 hours. And look! The mess is taken care of with ease and no staining. The Enduro Top can be paired with your choice of our 211, 214, or 216 outdoor table bases. Our E-coating process covers the inside and outside of the table base, making them weather- and UV-resistant. If you're in the market for a high quality, commercial-grade table that is price right, then the Enduro Top line of tables by Holland Bar Stool Company are perfect for you. Enduro Tops are available in 5 finishes and 2 sizes. Remember, the kiss of quality is only found on the best. Holland Bar Stool Company. 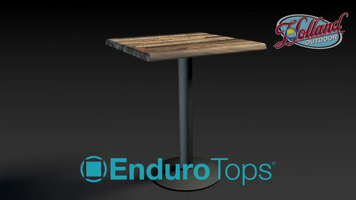 Innovative engineering brings us the Enduro Top table from the Holland Bar Stool Company! Designed to resist staining, moisture, UV rays, scratches, dents, and other signs of wear, this table is perfect for rough, heavy use applications and outdoor seating areas. Learn more by watching this quick demonstration. 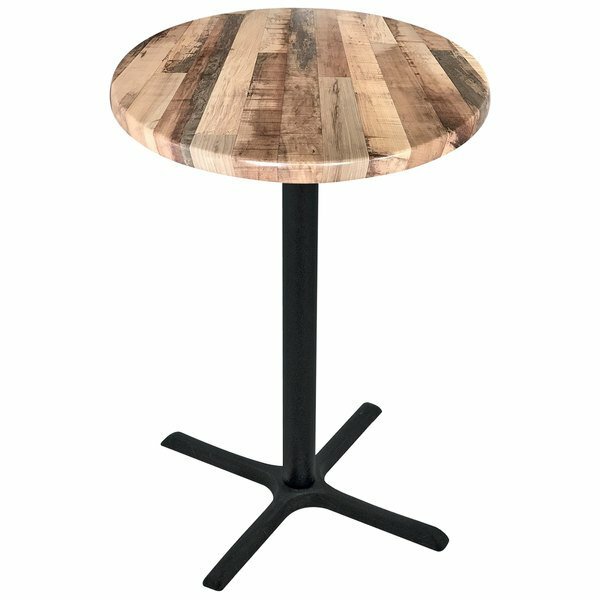 This Holland Bar Stool OD211-3042BWOD30RRustic 30" round rustic wood laminate outdoor / indoor bar height table is a great way to add a practical seating option to you indoor or outdoor dining space while still adding a look that is sure to catch your guests' attention. With a top constructed from a premium, composite blend material with a scratch, impact, and burn resistant laminate surface, this table will stand up in high volume operations without becoming worn down or damaged over time. The rustic wood laminate top color is as attractive as it is durable, so your customers will be left with a lasting impression of your operation! To ensure your top rests upon a solid foundation, the table's 42" tall base is made from commercial quality metal that is finished with a UV resistant black power coat to prevent fading when placed in an outdoor setting. Plus, the base has adjustable feet to prevent rocking and wobbling when placed on uneven surfaces. No matter what you're serving or where you're serving it, this sturdy and stylish table top and base will complement your establishment's atmosphere and provide the perfect backdrop for your signature beverages and dishes. Three to four people can comfortably sit at this table.